Recap of the Last Five (Games 16-20) · Let's Go Amerks! Welcome to the fourth part of a 15 part season series highlighting the last five games (the last segment will be six games) showing off the stats, standings, highlights, transactions and whatever else took place prior to the next five games. The goal is to post these the day of the next game of a five game set. A little different than a weekly format to give us a better snapshot of trends as the season goes. The team finished the last five games with a record of 3-1-1-0 and are heading into the game tonight looking to extend their winning streak to three games. A comeback win, two competitive wins, a concerning Friday loss, and coughed up an overtime loss is the simple way to summarize the last five games. They have a chance to extend the win streak to three games tonight. 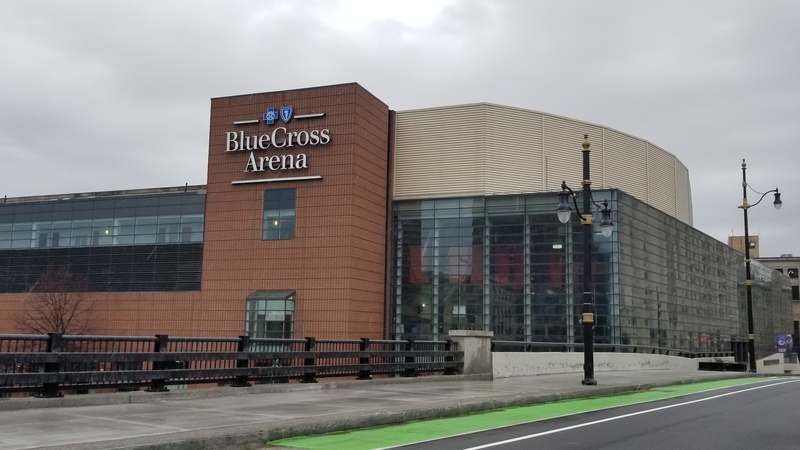 The featured picture shows Blue Cross Arena since the biggest news of the week was a new 15 year agreement between the City of Rochester and Rochester Arena LLC (an affiliate owned and operated by Pegula Sports and Entertainment). This brings stability to the old barn and the Rochester Americans franchise. See link below. The rest of the league has caught up in points after the Amerks dominated the first 10 to 15 games of the season. Zach Redmond had three points in the last five games which was good enough to keep him in the top 10. 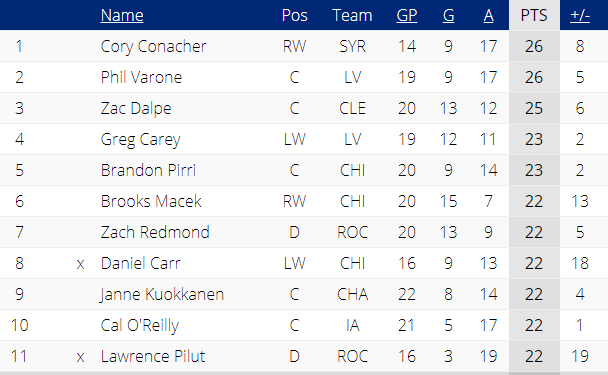 Lawrence Pilut will miss his third game as a call up but he’s still tied for 10th. Victor Olofsson had missed three games due to an injury and scored on Friday night after playing five games without one. The 19 points for Olofsson has him at 21st in the league. Zach Redmond continues to be on pace to break the all-time single season Amerks record for goals by a defenseman and will likely occur before 2018 is over. The record is 18 goals and he now has 12 goals in 20 games. The two goalies have both had stellar games helping to secure wins for the team, something that had been lacking since the start of the season. Adam Wilcox had a great game against Hartford to keep the team in the game as they scored three goals in the third to win 4-3. Scott Wedgewood had his own excellent game against Wilkes-Barre/Scranton on Friday night in a 35 save shutout. That’s not to say either goalie has been bad but sometimes teams need those wins from a goalie. There’s finally openings on defense for the extra players to make an impact. With Lawrence Pilut and Matt Tennyson called up the opportunity is here to see what Jack Dougherty and Brandon Hickey can do on defense. Out of the two, Dougherty has been an eye opener and with more playing time I think we’ll see a lot more out of him. The team went from having 10 defensemen on the roster to only having seven. Nathan Paetsch is the extra which means we may finally get to see him play in a game. Brendan Guhle has continued to be a question mark this season and was mentioned in the last five game recap as well. He looked slightly better on Friday night than the week before when two bad turnovers resulted in goals against. He isn’t joining or even leading a rush up the ice like he did last season. He hasn’t lost confidence in himself, the coaches haven’t lost confidence in him either but he’s definitely struggling to find his place again. Someday face-off stats will be made public and when they do the first name I’ll check is Sean Malone. Whenever there’s a draw it feels like he’s the one on the dot and winning the face-off. First period goals have been tough to find in this recent stretch. The Amerks only scored goals in the first period in one out of the last five games and that game ended in a 5-4 loss against Utica. They’re finding ways to win but the concern remains the same that they aren’t skating away with wins, they have to earn them. Syracuse and Cleveland continue to play well and they’re knocking on the door of the first place Amerks. Cleveland is three points back with a game in hand. Syracuse is four points back with two less games played than the Amerks. Anyone can win on any given night in the American League so points are valuable from game one through game 76. Rochester can extend the win streak to three games and start to build a lead and get back to winning games through all of the little details as a team effort. It’s pretty simple, score more than the other team and win. Goal scoring was almost even in the last five games with 15 for and 14 against. Scoring in the third period and keeping Wilkes-Barre/Scranton off the scoreboard on Friday night helped them along to three wins. The one thing that stands out in the shot totals over the last five games is the 47 shots on net against Utica, only allowed 23, and they still lost the game. That game was an example that quantity doesn’t always equal quality. A lot of the shots were right into the pads or chest, few rebounds that resulted in scoring chances. Other than that one game things have been pretty even. The power play continues to struggle and decline with productivity. They have only scored power play goals in two out of the last 11 games. The penalty kill has slightly increased its percentage but is still near the bottom of the league. I’m at almost every practice and these are a regular focus but it just isn’t bringing results. Other teams also watch video and have figured out how to minimize the risks by staying out of the penalty box. The good news is that they’re winning games at even strength. Heading into the 21st game of the season the Amerks continue to stay in first place in the North Division with almost every team having played 19 or more games. Syracuse still has two games in hand and they’ve extended their streak to 9-0-2-0. Déjà vu of last season after the Crunch started slow and then started to find their way. Based on winning percentage they’re in second place. The top two teams overall Eastern Conference standings have stayed the same since the last five recap with Charlotte ahead of Rochester. Enjoying the ride near the top but everyone knows there’s still a lot of season left to play and a lot to work on where you can’t feel comfortable. Some AHLTV feeds are better than others, this one wasn’t that great. We’ll give the highlight goal to Rasmus Asplund who scored his first of the season on November 18 at Hartford. Kyle Criscuolo – Lower body – week to week – Expected to start skating first week of December. Victor Olofsson returned on 11/18 after missing three games with a lower body injury.